On Sunday we decided to eat at Namu the Signature Japanese restaurant at our W Retreat Hotel in Koh Samui, I am normally worried about eating somewhere new but at this hotel the Food and Beverage Insider Sea Torres has been incredibly helpful and has ‘gone the extra mile’ to make sure that I have a trouble free holiday. She has spoken to both restaurants on my behalf explaining my multiple food intolerances gluten, yeast and onions and working with the chefs to find things that i could eat and enjoy. We booked our meal for 8pm to give us time to first sit up at the bar and listen to the DJ, even though the evening was cooler than usual for this time of year we could have stayed there all night. We took a short buggy ride down to the restaurant near the beach. A very modern structure, minimalist concrete floors with simple wooden tables and chairs. 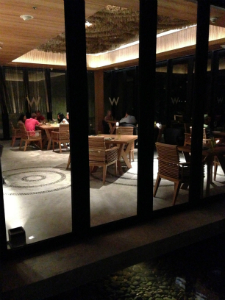 We had opted on Sea’s advice to sit at the chef’s table, along the counter of the open kitchen. Chef and Sea talked with me about choices for a starter and main course. I chose Sashimi using very fresh raw tuna, yellow tail and salmon on a bed of shredded turnip with a squeeze of lime and a little fresh wasabi. 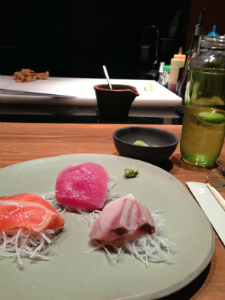 I had never eaten Sashimi before, I loved it, simple and delicious! 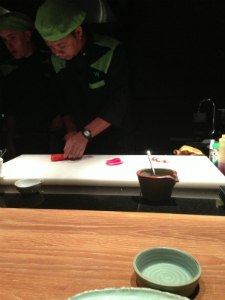 I do miss soy sauce etc but was amazed how tasty the food was with just lime juice and wasabi. 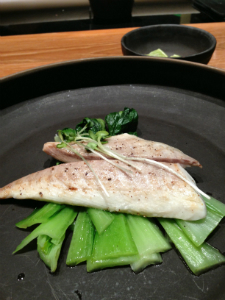 My main course was Sea Bream grilled with bok choi and steamed plain rice. I sometimes feel that although I cannot have many sauces and dressings on food, It makes me really appreciate the taste of the fish, meat etc as it is not taken over by other strong flavours. 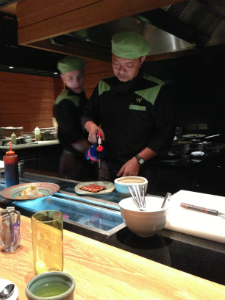 It was very interesting to watch the chef prepare many different meals while we were at Namu. Fabulous plates and bowls were used to add to the drama of the dishes. I must try that tip at home! 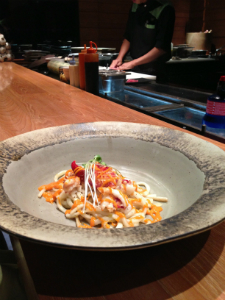 Mr S chose the soft shell crab sushi rolls followed by the most popular and signature dish of lobster claw and udon noodles which are made with wheat flour. Pictured above. He thought his meal was very good. The lobster was very well cooked and he very much enjoyed the sushi rolls. 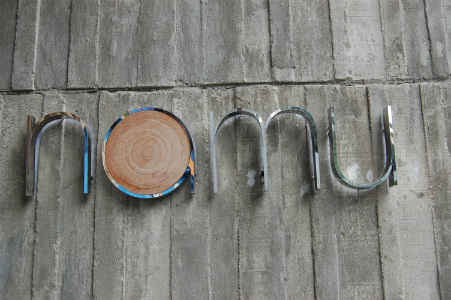 My visit to Namu was very enjoyable. 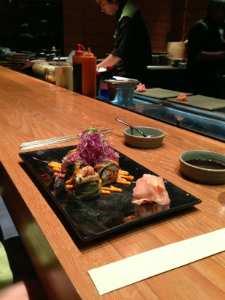 My Japanese meal was outstanding, something very different for me. It was well cooked and presented. The staff were helpful and friendly and we hope to return again before the end of our holiday in Thailand. A big thank you to the Chef, and Sea for making the evening such a pleasurable one.